The Independence Pass corridor was probably a summer hunting ground in prehistoric times. In more recent times, the Ute Indian people inhabited the Roaring Fork Valley and undoubtedly roamed the Pass and surrounding peaks and valleys in the course of their seasonal travels and hunting trips. Such sites as the Ice Caves near the Grottos recreation site may even have served as primitive refrigerators for the preservation of food. As settlers began moving into the Colorado Mountains during the mid-1800s the Utes were gradually forced onto reservations and were finally removed from the western slope in the 1880s after the Meeker Massacre. In 1873 the Roaring Fork Valley was first surveyed by the Hayden Geological Survey and was praised in the Survey Report for its great mineral potential. In 1879 the first prospectors crossed into the valley from the Leadville area. At that time, Independence Pass was called Hunter Pass, and it quickly became the main gateway into the Roaring Fork Valley from the more developed mining towns east of the Continental Divide. 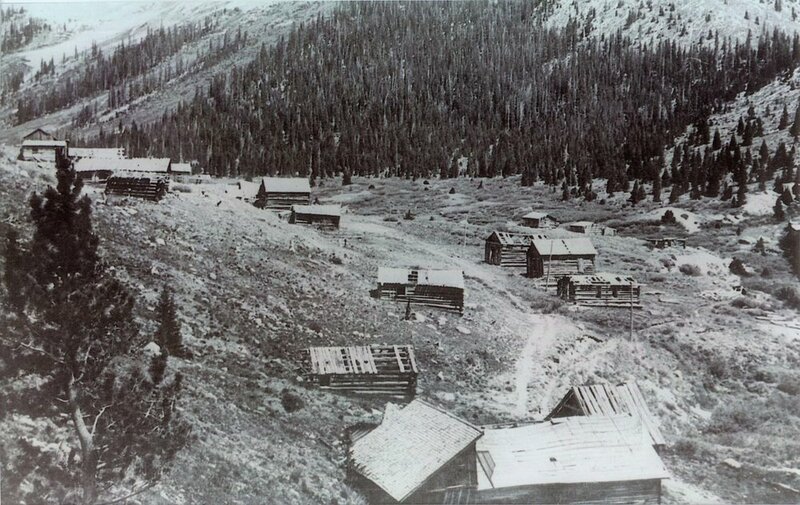 Silver mining took hold in the Aspen area and quickly grew into a major industry in Aspen. During these early years, the downvalley routes into the Roaring Fork were guarded both by the sheer walls of Glenwood Canyon and by the ongoing presence of the Ute Indians, whose territory included the Roaring Fork valley as far upriver as the Carbondale and Mount Sopris areas. Thus the upper Roaring Fork was settled from the top down, by settlers who struggled over the high passes of the Continental Divide. The first real road over Independence Pass was built in 1880--81 by B. Clark Wheeler, one of Aspen's most prominent boosters and businessmen. Using hand tools and manual labor, Wheeler's crews established a toll road along the route of the trail that had been used by mule trains over the years. There were several bridges along the 43 miles between Aspen and Twin Lakes on the east side of the Pass, and it was at these bridges where the tolls (25 cents for horses, 50 cents for wagons) were collected. In the 1880s the toll road was heavily used year around, as it was virtually the only way in and out of the valley for ore, supplies and people. The road over the Pass had rest stops and inns at Weller and Lost Man, where Forest Service campgrounds now welcome summer travelers. The remains of some of these facilities, and the old road platform, are still visible in many places along the corridor. In some locations, such as at the Grottos, the old road has been incorporated into the trail system for recreational use. In 1887 and 1888, railroads finally reached Aspen from downriver. The narrow-gauge Colorado Midland Railroad came into the Roaring Fork via the Fryingpan Valley and Hagerman Pass, while the Denver and Rio Grande Railroad came up the river from Glenwood Springs. The arrival of the railroads spelled the end for Wheeler's toll road, which gradually fell into disuse and neglect. The Town of Independence, about three miles west of the summit of the Pass, was founded, according to legend, by Billy Belden, one of the early prospectors in the area, who supposedly struck a rich vein of silver on the Pass on July 4, 1879. The camp previously known as Farwell, Chipeta, Sparkhill and other names, took the name of Independence. That name also stuck to the pass that had been known as Hunter. By 1880 a town had grown up, and the local mill processed over $100,000 worth of ore in the year that it operated. By 1882 the ore was played out, and the bustling settlement, whose population peaked at 1,000, shrank to the ghost town that intrigues travelers today. The last year-round resident of Independence moved out around 1912. Satellite settlements, such as Ruby in the Lincoln Creek drainage, likewise rose and fell with the miners' fortunes. The water diversion structures along the Roaring Fork and the Lincoln Creek drainages are interesting elements in the history of the Independence Pass corridor. These structures, built in the 1930s, are part of the Twin Lakes water project that captures water in the upper Roaring Fork and diverts it, through a complex plumbing system, to the eastern slope. The project was first conceived as a means of providing irrigation water to sugar beet farmers east of Pueblo, but in the years since, the water has been redirected to support municipal and industrial uses. Water from the Lost Man Creek drainage is collected at Lost Man Reservoir, where it is directed under the mountains to Grizzly Reservoir in the Lincoln Creek drainage. Grizzly Reservoir water is then sent under the Continental Divide to the Lake Fork drainage, which feeds Twin Lakes and points east. Today the scars of the old toll road can still be discerned crisscrossing the uppermost slopes of the Pass, and tumbledown mining structures can still be found along the road and in the woods. Fortunately, the works of man have not spoiled the countryside along the Pass corridor, almost all of which is now protected by Federal Wilderness designation.